Azure virtual machines (VMs) can be created through the Azure portal. This method provides a browser-based user interface to create VMs and their associated resources. This quickstart shows you how to use the Azure portal to deploy a virtual machine (VM) in Azure that runs Windows Server 2016. To see your VM in action, you then RDP to the VM and install the IIS web server. 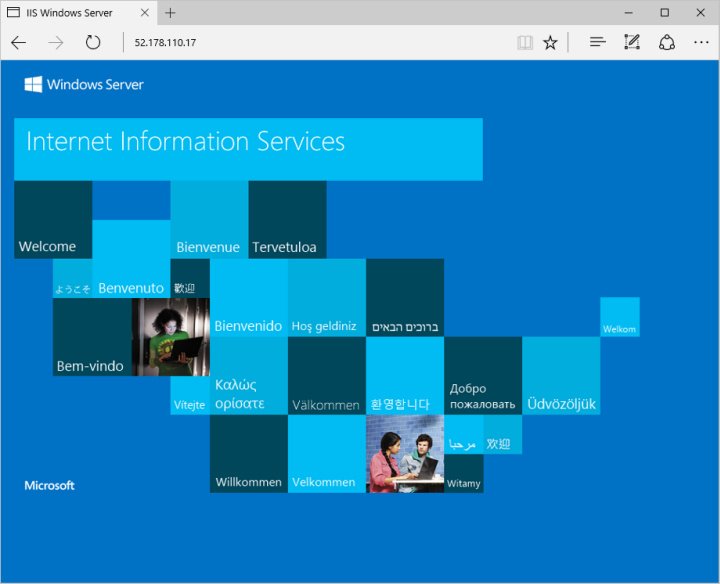 In the New page, under Popular, select Windows Server 2016 Datacenter. In the Basics tab, under Project details, make sure the correct subscription is selected and then choose to Create new resource group. Type myResourceGroup for the name. Under Instance details, type myVM for the Virtual machine name and choose East US for your Location. Leave the other defaults. Under Administrator account, provide a username, such as azureuser and a password. The password must be at least 12 characters long and meet the defined complexity requirements. Leave the remaining defaults and then select the Review + create button at the bottom of the page. Create a remote desktop connection to the virtual machine. These directions tell you how to connect to your VM from a Windows computer. On a Mac, you need an RDP client such as this Remote Desktop Client from the Mac App Store. Click the Connect button on the virtual machine properties page. In the Connect to virtual machine page, keep the default options to connect by DNS name over port 3389 and click Download RDP file. Open the downloaded RDP file and click Connect when prompted. In the Windows Security window, select More choices and then Use a different account. Type the username as localhost\username, enter password you created for the virtual machine, and then click OK.
You may receive a certificate warning during the sign-in process. Click Yes or Continue to create the connection. When done, close the RDP connection to the VM. When no longer needed, you can delete the resource group, virtual machine, and all related resources. To do so, select the resource group for the virtual machine, select Delete, then confirm the name of the resource group to delete. In this quickstart, you deployed a simple virtual machine, open a network port for web traffic, and installed a basic web server. To learn more about Azure virtual machines, continue to the tutorial for Windows VMs.